Home-made Presents from the Kitchen! At Christmas, more that at any other time of the year, it’s useful to get hints and tips on how to make things easier in and around the kitchen. Of course, these ideas can be applied to any time of year, but with extra guests and visitors turning up out of the blue at Christmas, this is when we tend to feel the pressure and need just a little help in the right direction. There is always a great interest in ideas for home made gifts, home baked and beautifully packaged gifts to give to family and friends. These can range from quite advanced crafts to simple home made cookies and cakes, but they are always welcome! Dress them well, pack neatly or place your hand made gifts in cellophane bags, add ribbons and a lovely gift tag to make an amazing first impression, your effort won’t go un-noticed! Those of you who have been to my kitchen, will know that I’m a huge fan of Kilner jars, the traditional preserving jars. 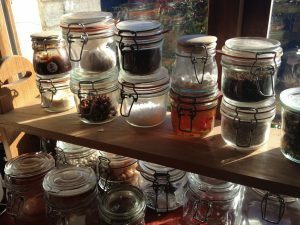 I have shelves full of them, containing everything from sugar, spices, pasta, right through to ribbons and buttons. They are available in most cook shops, craft shops and even supermarkets during the jam making season. To make a stylish and useful present, fill a Kilner jar with all the ingredients needed to make chocolate cookies, brownies or Welsh cakes, add a little parcel label with the instructions on how to make them, and you have another sweet and useful gift. The storage jar can be used again and again, whilst the contents offer and activity and a sweet treat, three pressies in one!! By the way, just like the packet mixes in the shops, don’t add the wet ingredients!! Don’t add eggs or butter, just the dry stuff!! For gifts to make now and give and use on the day, try making your own cranberry sauce with fresh cranberries, orange zest, sugar and a drop of port. Store the sauce in a Kilner jar and take it with you as a gift for the family ready for the Christmas dinner. 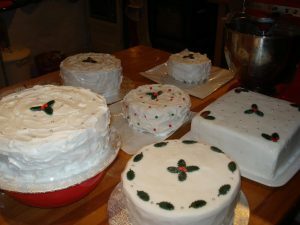 If you have a little more time on your hands, how about making special friends a decorated Christmas cake? Wrap it in a pretty box and tie shut with a ribbon… what could be better? Here’s my favourite luxury Christmas Cake recipe, and although stir-up Sunday has now been and gone…. it’s really not too late to bake a cake! Place the softened butter, beaten eggs into a mixer, and mix well, add the remainder of the ingredients. Cook on the middle or low shelf for 3½ – 4 hrs at 140˚c. Check the cake after 3 1/2 hours especially if using a fan oven. Have fun decorating with marzipan, icing and Christmas sprinkles / holly / silver balls and a ribbon! but we use recycled small food tins as cake tins. Cooking time will be about 30-40 minutes.